The key to selecting durable bakeware to last decades is to choose bakeware with a heavy steel construction material which will allow for even heating and a long lasting life. I would only ever use bakeware with a nonstick coating so as to not waste time with lining and greasing pans. 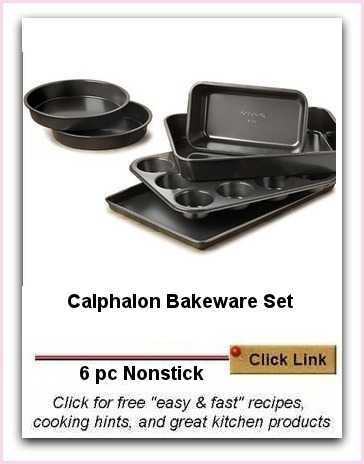 This Nonstick Bakeware Set by Calphalon is made of heavy-gauge metal, features a durable, double-thick, nonstick coating for effortless release and swift cleanup. Calphalon assures, the surfaces will never chip, crack, peel or warp even under the hottest oven temperatures. Durable black colored nonstick finish provides: easy release, easy clean-up and safe for use with nylon, coated or wooden utensils. Oven safe to 450°F/230°C. Not safe for use in the broiler. As you know, I cook scrumptious treats and meals having mastered over many years, how to cook tasty food with the fewest possible steps. One of my secrets is the extensive use of the oven for cooking. The key to cooking when you do not have the time to cook gourmet meals, nor the time to stand over a stove is to let the oven do the cooking for you. It takes minutes with my shortcut methods to make cakes, pies, cookies, no-yeast breads. You're free then to do productive work, or chores or just to have time with the children. I'm certain they'd rather have you read to them than watch you slaving in the kitchen for an hour or more. My own kitchen equipment including my bakeware set has lasted me decades. Always invest in the best for durability. Caution: Non-stick surfaces need to be cared for. To help your quality Calphalon Bakeware Set last years, wash with a soft cloth and do not scour the surface. Ever.